Former congressperson Michele Bachmann says she is waiting to hear back from God about whether to run for the US Senate seat vacated by Al Franken. Saying she “had people contact me and urge me to run for that Senate seat,” Bachmann told televangelist and convicted felon Jim Bakker last week that she has asked God whether it is “His will” that she run. Donald Trump’s phrase has become a virtue signal among white evangelical culture warriors. Roy Moore used it in Alabama as a way of conflating the Washington Post with Senate Majority Leader Mitch McConnell in a vast establishment conspiracy. For Bachmann voters, “the swamp” includes every media outlet that would accurately report the crazy things that have come out of her mouth. “If you stand for biblical principles in DC…the blades come whirring,” Bachmann said. Her public piety is red meat to fellow culture warriors. I’ve counted 16 lib journos so far tweeting snide mockery of Michele Bachmann for asking God’s help in deciding whether to run for Senate. In a flash of class consciousness, Bachmann complained that she and her husband are “normal people” rather than “money people” who can afford to run for office. But that momentary gleam of insight melted away in the fires of her cultural resentment. When Bachmann describes herself as “normal,” she is projecting a minority view. Of course, Bachmann may have doubts that her god really is “calling” her to run. If so, the massive Democratic midterm wave building up in America explains her doubts much better than soft whispers from her sky-daddy. Democrat Tina Smith, Minnesota’s lieutenant governor now taking over the Senate seat, might actually prefer to run against Bachmann in the 2018 environment. When I have sensed that the Lord is calling me to do something, I’ve said yes to it. But I will not seek a higher office if God is not calling me to do it. That’s really my standard. If I am called to serve in that realm I would serve, but if I am not called, I wouldn’t do it. Bachmann was the battiest member of Congress, passing exactly zero legislation, so kooky that her own leadership (“the swamp”) pushed her to the sidelines. She was the loudest purveyor of goofy conspiracy theories that have become “truths” in the pro-Trump echo chamber: she channeled the ghost of Joe McCarthy with an anti-Muslim witch hunt. She accused Huma Abedin of being a Muslim Brotherhood spy. She led Reps. Louie Gohmert and Steve King on a weird, Breitbart-infused mission to Egypt. Then came her “call” to run for president, a miserable failure that ended after the Iowa Caucus. But as Bachmann explained to Bakker, that was all part of God’s plan to shift the conversation towards repeal of Obamacare. Maybe there is a God. Maybe She has a plan. Maybe the plan is for Michele Bachmann to run for Senate and to lose to Tina Smith. After all, Her divine plan was for Roy Moore to win the primary and then lose to Democrat Doug Jones. We are told that She does move in mysterious ways. 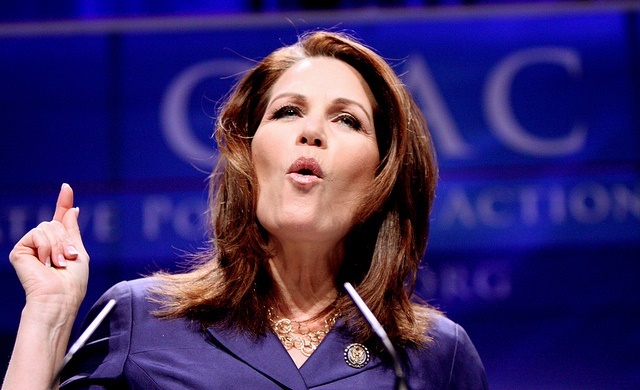 Bachmann, like all too many evangelical politicians, is a truly DANGEROUS Christian Nationalist. Her allegiance is to the Christian Dominionist/Christian Reconstructionist sector, an ideological hybrid that perverts both religion and government. Ironically, this places her and those like-minded in undeniable conflict with the Constitution they claim to revere. May their tribe decrease!